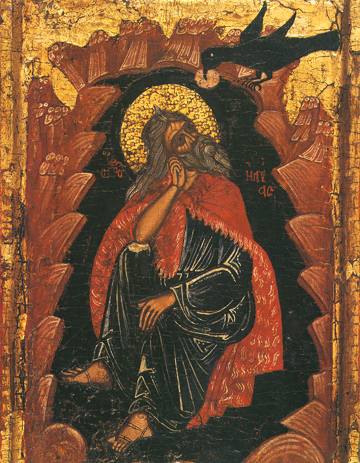 The Prophet Elias (Elijah) was one of the two people from the Old Testament who appeared talking with Christ at His Holy Transfiguration before His Disciples Peter, James, and John. By God’s grace the Prophet was mighty before men and God, raising the dead, multiplying meal and oil, and parting the waters of the Jordan to go across dry shod with his disciple Elisha. By his prayer God withheld rain in Israel for three and a half years, then sent it when Elias prayed again. God honored him, helping him by sending a raven to feed him twice a day when fleeing from the impious King Ahab and his pagan wife Jezebel, and by revealing Himself to the Prophet Elias in the still, small voice he heard on Mount Horeb. Yet all of this came at a price, for he was hunted by King Ahab, denounced by the false prophets of Ba’al, and often ignored by the Israelites until God sent fire out of Heaven to burn his offerings from ignited water in front of many Israelites on the top of Mount Carmel. He lived in the wilderness for a time, and was called to come again before King Ahab at peril of his life. Faith-fullness comes to us in spite of difficulties to those who chose faith.